This recipe produces amazingly crisp, flavorful crust. You should use a deep fryer, if possible, for this recipe -- it makes the frying very easy and low stress. You can also use a deep, heavy pot (cast iron is best) along with a high-temperature thermometer. Preheat the frying oil to 350 degrees. Mix together 1/2 tsp. cayenne pepper, 1/2 tsp. black pepper and 1/4 tsp. salt, and sprinkle this mixture evenly over the chicken parts. In a medium bowl, whisk together the corn starch, buttermilk, and garlic salt until smooth. In a shallow dish (like a pie dish), mix together the flour, 1/2 tsp. cayenne pepper, 2 tsp. black pepper and 2 tsp. salt. You can toss in another healthy pinch of cayenne if you want more kick! To batter the chicken, toss a couple pieces at a time in the flour mixture until they are completely coated. Then place the chicken pieces in the buttermilk mixture, gently turning until all sides are moistened. Then take one piece at a time and remove from the buttermilk mixture, allowing any excess to drip off, and roll in the flour mixture again until completely coated. Gently place a few chicken pieces at a time in the hot frying oil (do not overcrowd; use a frying basket if you have one), turning the pieces a couple time with tongs. 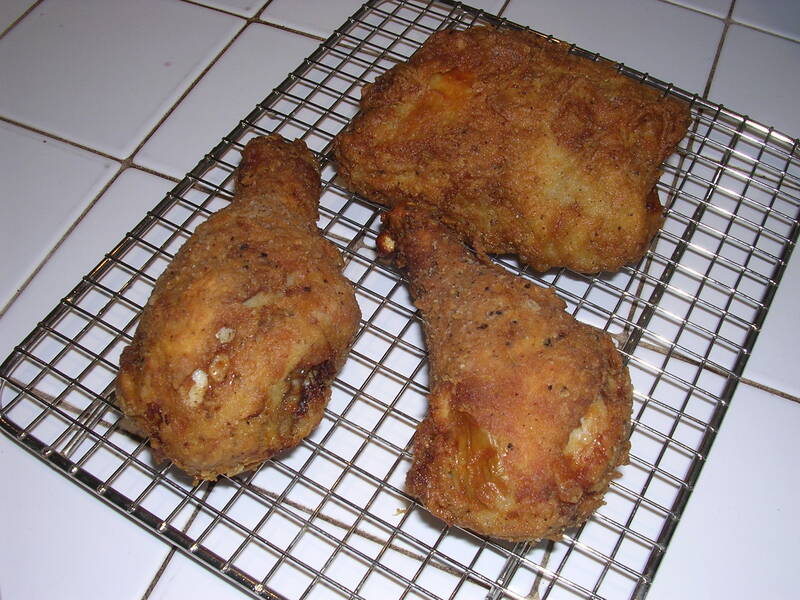 Fry breasts for 10 minutes, thighs for 12 minutes, and drumsticks for 13-14 minutes (in all cases, err on the longer side for larger than normal pieces), until the crust is a deep golden brown. Remove the fried pieces to a rack placed on a baking sheet (this is a key to crispier crust -- drain on racks, not paper towels!). Place in a 150 degree oven to keep warm while you fry the rest of the chicken pieces.